"fluxiom makes it easy to organize and share your digital assets within your company, your colleagues and friends. Manage any kind of file like corporate media assets, marketing materials, product folders, contracts, images, text documents, logos or artwork – you name it." "Instead of relying on the browser to revalidate its cache, if you change an object, change its URL. One simple way to do this for static objects if you have staged pushes is to have the push process create a new directory named by the build number, and teach your site to always reference objects out of the current build's base URL. (Instead of <img src="http://example.com/logo.gif"> you'd use <img src="http://example.com/build/1234/logo.gif">. When you do another build next week, all references change to <img src="http://example.com/build/1235/logo.gif">.) This also nicely solves problems with browsers sometimes caching things longer than they should -- since the URL changed, they think it is a completely different object." "I’ve long thought the potential of 2D codes, like QR, Semacode and others, was enormous - but very few handsets are equipped, by default, with the capability to scan codes. Consequently, we see very few codes embedded in online services or the physical world. Microsoft’s move could help to kick start code usage… I have a niggling feeling that there’s a compelling intersection of microformats and 2D codes." "A lot of programmers that you might interview these days are apt to consider recursion, pointers, and even data structures to be a silly implementation detail which has been abstracted away by today’s many happy programming languages. “When was the last time you had to write a sorting algorithm?” they snicker. Still, I don’t really care. I want my ER doctor to understand anatomy, even if all she has to do is put the computerized defibrillator nodes on my chest and push the big red button, and I want programmers to know programming down to the CPU level, even if Ruby on Rails does read your mind and build a complete Web 2.0 social collaborative networking site for you with three clicks of the mouse." "In a world where SOA and VoIP work hand in hand, more natural scenarios become possible. I have, for example, been dealing with a stalled purchase order of my own for several days. The business rule says that I have to contact two parties, who must in turn reach an agreement. But we’ve all been playing voice-mail or e-mail tag, and so far we haven’t managed to close the loop. It’s admittedly creepy to imagine empowering that business rule to detect our common availability, initiate a conference call, and receive a signal from us that tells it to proceed. But the alternative that we constantly endure is arguably worse." Wikipedia: "Structure and Interpretation of Computer Programs (SICP) is a textbook published in 1985 about general computer programming concepts from MIT Press written by Massachusetts Institute of Technology professors Harold Abelson and Gerald Jay Sussman, with Julie Sussman. It has been used as the textbook for an introductory course in computer programming for students of computer science at MIT, where it is known as 6.001, and at other schools. Now in its second edition, it is widely considered a classic text in computer science." "If you prematurely narrow in, you'll end up only showing them stories about melting Antarctic ice shelves without connecting to the rest of environmental, travel, or scientific stories that they're really interested in. The best way to make those connections is to mix it up. Doing this creates serendipity: pleasantly surprising the user. For example, don't show just the top 10 most similar items in your recommendations list, but show the eight most similar and two from the mid-range. Or call the "less relevant but also likely to be interesting" results out like you're advertising them: put a heading like "Take a walk on the wild side" or "Break out" on top and act like it's a feature you're offering, not a bug you're fixing. Breaking out of the tight circle of self-similar recommendations is a feature." 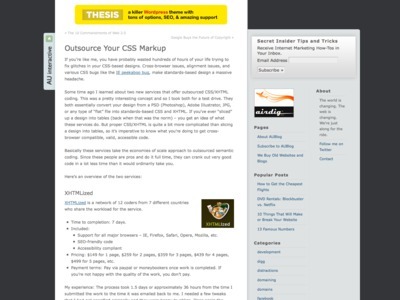 "Some time ago I learned about two new services that offer outsourced CSS/XHTML coding. This was a pretty interesting concept and so I took both for a test drive. They both essentially convert your design from a PSD (Photoshop), Adobe Illustrator, JPG, or any type of “flat” file into standards-based CSS and XHTML." (He's testing XHTMLized and PSD2HTML). "EASY is the most important feature of any website, web app, or program. If you plan on developing a successful webapp, plan for scalability from the ground up. User generated content and social software trends"
"The familiar software project, at least as seen by the nontechnical manager, has something of this character; it is usually innocent and straightforward, but is capable of becoming a monster of missed schedules, blown budgets, and flawed products. So we hear desperate cries for a silver bullet--something to make software costs drop as rapidly as computer hardware costs do. But, as we look to the horizon of a decade hence, we see no silver bullet. There is no single development, in either technology or in management technique, that by itself promises even one order-of-magnitude improvement in productivity, in reliability, in simplicity. 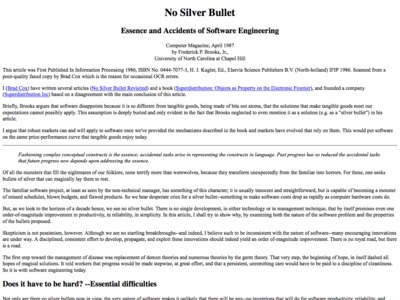 In this article, I shall try to show why, by examining both the nature of the software problem and the properties of the bullets proposed. 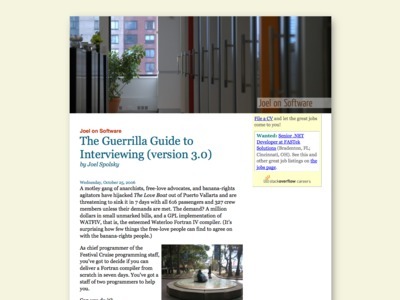 [...] Software people are not alone in facing complexity. Physics deals with terribly complex objects even at the "fundamental" particle level. The physicist labors on, however, in a firm faith that there are unifying principles to be found, whether in quarks or in unifiedfield theories. Einstein argued that there must be simplified explanations of nature, because God is not capricious or arbitrary. No such faith comforts the software engineer. Much of the complexity that he must master is arbitrary complexity, forced without rhyme or reason by the many human institutions and systems to which his interfaces must conform. These differ from interface to interface, and from time to time, not because of necessity but only because they were designed by different people, rather than by God." Software people are not alone in facing complexity. Physics deals with terribly complex objects even at the "fundamental" particle level. The physicist labors on, however, in a firm faith that there are unifying principles to be found, whether in quarks or in unifiedfield theories. Einstein argued that there must be simplified explanations of nature, because God is not capricious or arbitrary. "Microsoft's SharePoint push has made team-style collaboration a hot buzzword in Windows IT shops -- mainly because Redmond's made it so easy. Grab a template, add some team-specific content, spend a little time handling permissions and you can have a fairly sophisticated internal collaboration site up and running in hours rather than weeks. You can even open it up to specific users outside the firewall. That's powerful stuff no matter how you slice it and certainly a competitor or collaborator to the Wiki wave flowing over the rest of the Web. But while RSS certainly fits into this mold, collaboration really isn't where we're looking to use RSS. Frankly, I'm all collaborated out." "I think that topic maps are useful and attractive as far as they go: for the general business problem of managing metadata and associating it with data objects, it's well suited and well thought out. Why do I think that topic maps (and anything similar, such as RDF) is not suitable for knowledge representation? For the simple reason that knowledge representation is much more sophisticated and subtle than just topics with associations. " "Fontifier lets you use your own handwriting for the text you write on your computer. It turns a scanned sample of your handwriting into a handwriting font that you can use in your word processor or graphics program, just like regular fonts such as Helvetica." Is IT on the rise again? "In the old days, a company had to adjust its business processes to the packaged application. Now, due to SOA, a company can adjust the applications or services to the business processes they want. Along with this reversal comes the need for IT staffers who have the business acumen to organize these services. Paul Brunet, an IBM spokesman for the Georgetown partnership, puts it this way: Instead of telling the CIO that it will take four months to program a service, IT staff must be able to say, “Here is the value this service will return, and we can bring this service to this market in three months and to another market in four months.”"
"New comments can be General Comments as well, or they can be "Block" comments. 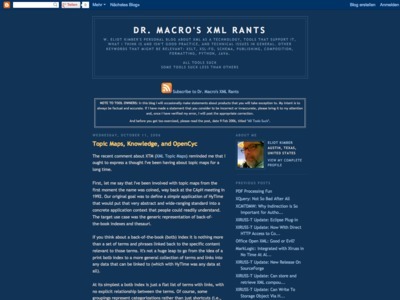 A "Block" is any paragraph, image, title or code in a post. When you select a block to comment on, it is highlighted in blue. Comments can be posted anywhere in an article. If you see something and you wish to comment on it, click on the comments bar directly next to it. To view the comments posted by readers, click on the yellow indicator next to that "Block" on the comments bar." "No matter how much news I absorb, I am always left with some important questions of context that seem conspicuously unanswered. [...] My complaint is that these things should be included prominently in the news so the ignorant and lazy viewer such as me receives the right context without working too hard. Without proper context, the news is misleading at best, and intentionally biased at worst. For example, Iran has 25,000 Jewish citizens. The media made a big deal – and rightly so – about the president of Iran’s comments about “wiping Israel off the map,” and of his questioning the Holocaust. For context, wouldn’t you like to know how the Jews living in Iran are being treated? I know I can research that question on my own, but it seems like an important bit of context that was missing from the media reports." "OK, your code is well-tested. Your code is better designed. You have intuitive APIs that anyone can use. Most processes are automated to remove bug-prone grunt work. You’re well on your way to making a system that’s easy to use, refactor, and extend. But you’ve paid a price. You’ve front-loaded your costs."